Stargazers have a lot to look forward to this month. 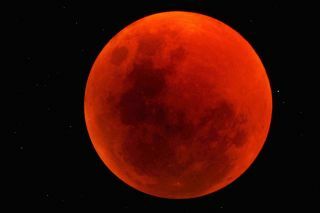 The first of April's two eclipses comes in the early morning hours of April 15, when Earth's shadow will darken the moon in a total lunar eclipse visible throughout North and South America, Australia, New Zealand and other parts of the Pacific region. Totality will last from 3:07 a.m. until 4:25 a.m. EDT (0707-0825 GMT), while partial phases of the eclipse will be visible for a few hours before and after this stretch. The solar eclipse will occur two weeks later, though very few people will get to appreciate its full glory. On April 29, an annular or "ring of fire" eclipse will be visible from a small patch of Antarctica, perhaps briefly confusing some penguins around the time of greatest eclipse, 2:04 a.m. EDT (0604 GMT). But there will still be something for some Southern Hemisphere stargazers to see. "Skywatchers in Australia and southern Indonesia will see a partial solar eclipse," narrator Nancy Calo said in an April skywatching video guide released by the Hubble Space Telescope science team. Sandwiched between these two eclipses is the Lyrid meteor shower, which occurs each year in April when Earth plows through debris shed by Comet Thatcher. While the Lyrids generally aren't as spectacular as August's Perseids or December's Geminids, they can still put on a good show. "The Lyrid meteor shower will be best seen in the early morning hours of April 22nd," Calo said. "Expect to see up to 20 bright meteors per hour after midnight." Mars will continue getting slightly bigger and brighter throughout the first two weeks of April as the Red Planet makes its closest approach to Earth of the year. This milestone comes on April 14, when Mars will be just 57 million miles (92 million kilometers) away from us. And about a week earlier, on April 8, the Red Planet reaches "opposition" — a point in the sky directly opposite the sun. At opposition — which occurs once every 26 months — the sun, Mars and Earth are arranged in a straight line. The dates of opposition and closest approach are offset by nearly a week because the planets' orbits are elliptical rather than perfectly circular. Those elliptical orbits also dictate that some approaches are much closer than others. In August 2003, for example, Mars came within just 34.6 million miles (55.7 million km) of Earth — its closest pass to our planet in the past 60,000 years. April also features oppositions of the protoplanet Vesta and the dwarf planet Ceres, the two most massive residents of the asteroid belt. Vesta, which is about 326 miles (525 km) wide, reaches opposition on the morning of April 13. It will be an easy target in binoculars during the predawn hours and should even be visible with the naked eye, experts say. The 592-mile-wide (952 km) Ceres will be directly opposite the sun in the sky on April 15, in the constellation Virgo. Though it's not as bright as Vesta, Ceres should be visible through binoculars, appearing as a point of light, like a star.